Just when I think old man Winter is gone for good, he laughs at me with a cold blast of wind and rain that chills me to the bone. 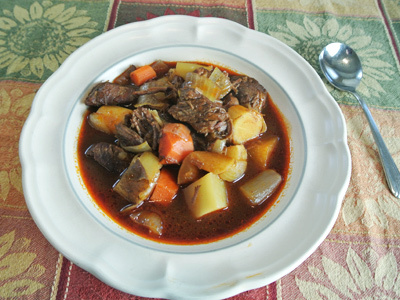 So I decided to make up a hearty bowl of braised beef stew with root vegetables to warm up. I spent an afternoon prepping the meat and veggies and as they simmered on the stove, the aroma and warmth it brought was a welcome feeling. And with such a large pot of stew I would have leftovers for a couple days. A little break from the kitchen would give me some extra time to pick up a book and enjoy some “me” time! 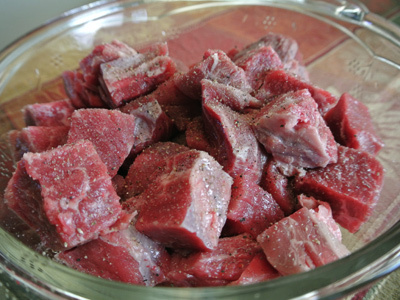 I trimmed and cut into 1 inch cubes a 2.5 pound Chuck Roast. I seasoned it with a sprinkle of salt and pepper. 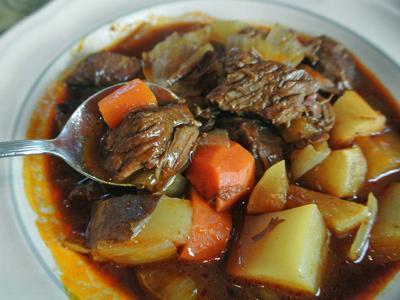 The beef will simmer in a flavorful stock. 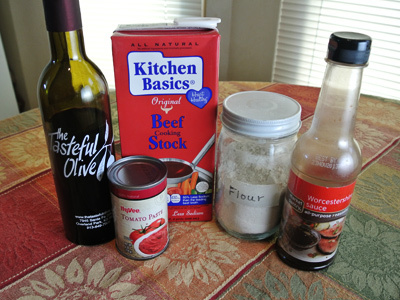 A box of beef stock, balsamic vinegar, worcestershire sauce, tomato paste and some flour for thickening. 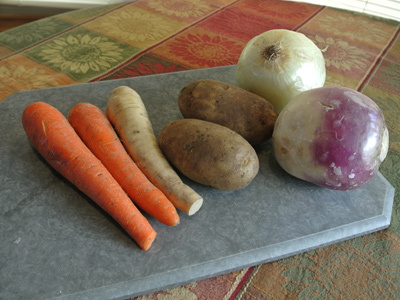 I chose a variety of root vegetables; carrots, parsnip, potatoes, onion, and a turnip. If any of these don’t suit your taste buds, by all means leave it out. 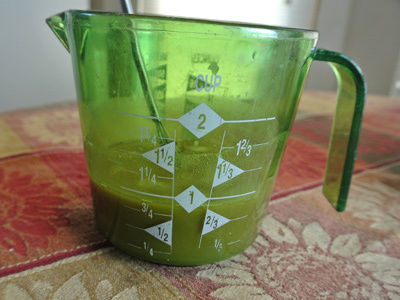 Just make up 8 – 10 cups of whatever root vegetables you like and it will taste fantastic, I promise! 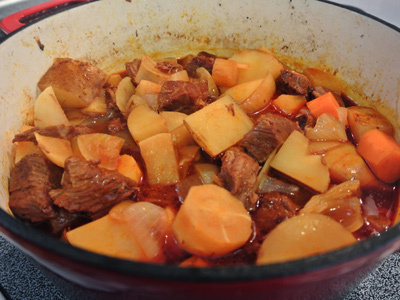 In a large dutch oven brown the beef on all sides on medium high heat. Let the meat get nice and brown, it may take a few minutes for all the juices to evaporate and get that nice caramelized browning. When the meat is nice and browned and the bottom of the pot is crusty, pour in 3 cups of the beef stock. 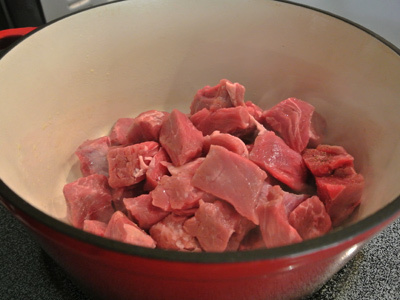 Reserve 1 cup of the beef broth and add the 2 tablespoons of flour. Set this aside to pour in at the end of cooking time. 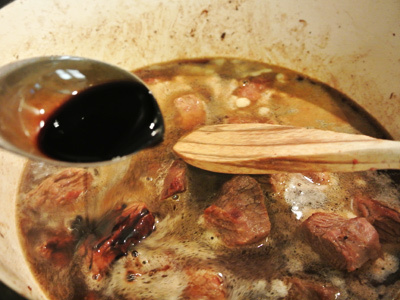 Add the balsamic vinegar, Worcestershire sauce and tomato paste and stir to combine. Bring the stock to a boil, then cover with the lid, turn the heat down to low and let simmer for 1 1/2 hours. Look at that rich coloring! It’s so flavorful and I could eat a bowl right now, it’s so good! Time to add the veggies. Peel and cube the carrots, parsnip, turnip and onion. I left the skin on the potatoes so Joe would know which veggies to pick out. He likes the potatoes, carrots and onions but the rest . . not so much! Now that you’ve stirred the veggies in, it’s time to add the reserved cup of flour and stock. Whisk first before adding to the pot. 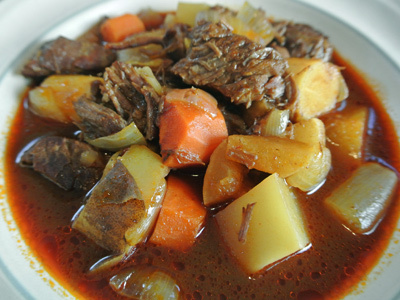 Again, bring the stew to a boil, then cover and simmer for 30 – 45 minutes more or until the veggies are fork tender. Ladle a big bowl of steamy goodness. Generously season the beef cubes on all sides with salt and pepper. Heat a drizzle of olive oil in a large dutch oven over high heat. When the oven in hot, brown the beef on all sides, taking time for the juice to evaporate and caramelize the beef slightly. 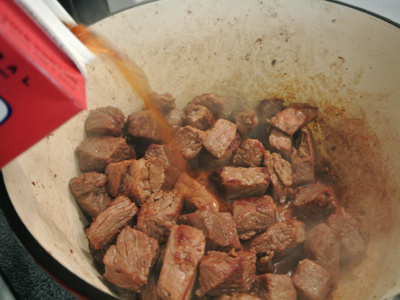 When the beef is browned and the bottom of the pot is crusty, pour in 3 cups of the beef stock to de-glaze the pot. Reserve 1 cup of the stock and add the flour. Whisk together and set aside until the end of cook time. 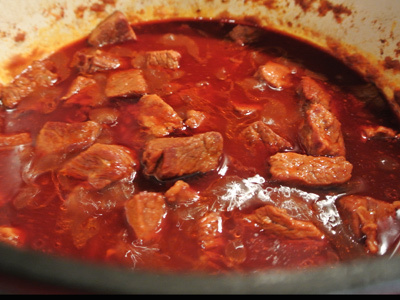 Add the Worcestershire sauce, balsamic vinegar and tomato paste to the pot. Stir the pot and bring contents to a boil. Cover the pot with the lid, turn the heat down to low. Simmer for 1 1/2 hours. Prep the root vegetables, peel and cut into 1 inch cubes. After the initial 1 1/2 hour simmer, add the veggies to the pot along with the reserved cup of beef stock and flour. Stir the pot and bring to a boil. 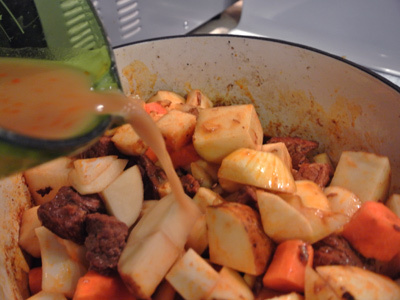 Cover the pot with the lid, turn the heat to low and simmer for 30 – 45 minutes or until the vegetables are fork tender. Great idea Anne! I’ll be sure to make some mashed potatoes next time!